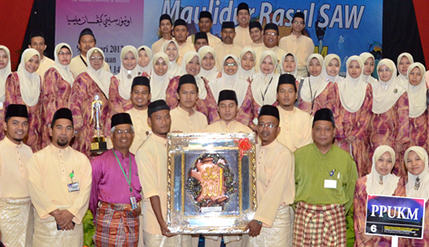 BANGI, 9 Feb. 2012 – The team from UKM Medical Centre Cheras came in first in a procession competition held in conjunction with the Celebrations of the birthday of Prophet Mohammed organised by the National University of Malaysia (UKM) today. The Tun Seri Lanang Library team was judged the second best followed by the Kuala Lumpur Group in third place, Registrar Department in fourth and the Department of Development and Maintanance. About 1450 UKM staff representing 19 groups took part in the procession which started at 8 am marching through the main campus here. There was also a group which represented the university’s senior management. The procession ended at the Chancellor Tun Abdul Razak Hall (Dectar) about 9.30 am followed by renditions of the nasyid, Quran reading and a forum. An exhibition “The treasures of Religious men in Nusantara, heir to the Prophet” was also held at Dectar. It will be shifted to the Chancellory Building Foyer from 14 to 21 February. The exhibition is to commemorate of Prophet Muhammad’s SAW birthday through remembering the contributions of religious figures in the advancement of knowledge. It is also to appreciate the struggles and sacrifices of the Prophet in disseminating science and knowledge while recognising contributions of religious figures in the region.